The perfect wash solution at an incredible value! Pinnacle Natural Brilliance's car waxes are used on the winners of the most prestigious car shows! Pinnacle's tradition of crafting award winning Ivory Carnauba wax blends spans over two decades. Pinnacle Liquid Crystal Waterless Wash Concentrate with Carnauba continues this precedent by joining Pinnacle's line up of carnauba wax formulas with its high-lubricity waterless wash. Safely clean road soil, dirt, dust, and smudges without scratching the most delicate paint surfaces while adding warmth, shine and protection. Now you can enjoy all of the benefits of Liquid Crystal Waterless Wash in a powerful concentrate that dilutes at 1 part concentrate to 32 parts water! Pinnacle Liquid Crystal Waterless Wash Concentrate with Carnauba washes your automobile without the use of water while leaving your paint with Pinnacle's famous show car shine. A combination of advanced bonding polymers and premium carnauba wax impart a layer of protection across your paintwork. Pinnacle Liquid Crystal Waterless Wash Concentrate with Carnauba adds a deep, wet appearance to any finish but projects a particularly stunning effect when used with Pinnacle Souveran Carnauba Paste Wax. 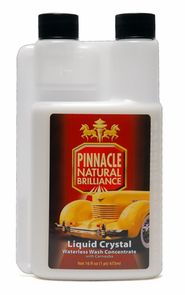 Pinnacle Liquid Crystal Waterless Wash Concentrate with Carnauba is a luxurious waterless auto wash that safely cleans the most precious paint without dulling the shine. This high lubricity formula encapsulates road pitch, dust, and other common soil, safely allowing it to glide off the paint. You can use Pinnacle Liquid Crystal Waterless Wash to clean most exterior surfaces: glass, trim, brightwork, wheels, and more! Use Pinnacle Liquid Crystal Waterless Wash with Carnauba to clean your automobile. The gentle cleaning action and the award winning shine of carnauba make this product ideal for cleaning paint while adding a deep shine. Use Pinnacle Liquid Crystal Waterless Wash with Carnauba to evoke looks of admiration on your daily driver as well as to remove admirers' fingerprints at car shows. You can bathe leak prone antique cars with confidence. Pinnacle Liquid Crystal Waterless Wash is perfect on the show car lawn and ideal in your garage. For best results use Pinnacle Liquid Crystal Waterless Concentrate Wash with Carnauba on a cool surface, out of direct sunlight. Dilute concentrated formula, 1 part to 32 parts of water. Spray onto the exterior surface to be cleaned. Using one side of a premium microfiber towel, such as a Gold Plush microfiber, spread the product over the surface using an overlapping motion. Turn to the dry side of the towel and gently wipe to a high-gloss shine. For heavy soiling use more product. Switch to a clean microfiber towel as needed. Continue washing each panel in a similar fashion until the entire automobile is clean. Note: 64 oz. and 128 oz. refills include a 36 ounce detail bottle. Easy to use and great value. I will never sea bucket and soap again. I use Pinnacle Liquid Crystal Waterless Wash with Carnauba almost every day before I drive my cars. Very seldom I need to wash my cars. The product has carnauba beside the cleaner which feel like wax after use. Also great for windows and interior wood especially in the interior of my Bentley. A trick I use, is to lightly spray a microfiber and very lightly remove dust over the car before applying the spray with a fresh microfiber cloth. The concentrate is a great buy over the bottle size. I've only been using the waterless concentrate for a month or so, but so far so good. I've used it on our three cars at least one. I will say that you can't really clean a really soiled or dirty car with this, but for light dirt it does a great job. I use one towel to apply it, and one to wipe/buff it off. Takes about 10 minutes to do a car, and the results are terrific. I used a bit more pinnacle than recommended in the mix, but this is still going to last me a long time. Professional results in a SNAP! This product was recommended to me by Todd, and I am REALLY glad he did! It is far and away my go-to spray when I need to shine/slick up a car in a hurry. I use it over a coat of Blackfire Wet Diamond sealant and it amps up the shine and glow, as well as bringing back the great slick feeling that BFWD is known for. I work at a highline dealership, and demo'd this product for our GM on some showroom cars that were covered in dust and greasy smudges from people getting in and out of the cars all day. One spritz per panel (2-3 for hoods and roofs, obviously) and a quick wipe is all it takes! Great as a claybar lube, and even on glass - no streaks. Adds some protection in between full 2-bucket washes as well. The price is great, too - the 16 oz bottle of concentrate makes FOUR GALLONS of ready to use spray, which should last a LOOOONG time for the average user, considering it really doesn't take much to get the results you want. As long as a car isn't completely crusted in dirt and mud, this product should easily cut through most normal road grime. The bigger bottles are an even better value, I just can't imagine NEEDING that much, haha.